Whenever I hear of Singapore Armed Forces (SAF) officers who earn as much or more in civilian life as they did when they were in uniform, I am both happy and concerned. Happy for the individuals whose years of service and experience in the military has been recognised and rewarded by the civilian sector. At the same time, one wonders if the remuneration for SAF officers has kept up with the times. The situation described above is not as uncommon as one would expect. SAF officers are said to command higher remuneration packages as compared to equivalent civilian jobs because of their shorter career spans. In simple terms, SAF officers are paid more because their career end point terminates around the age of 45. If that is the case, one can see three immediate reasons for those who are worth the same salary after leaving the SAF. First, the individuals are the outliers. They are exceptional talent valued by free enterprise. Second, the market-plus pay scale for SAF officers has lost some of its market competitiveness. Last, some civilian employers are over-paying their SAF alumni. 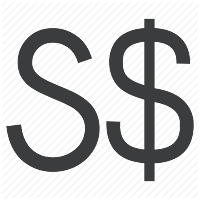 In a free market economy, it is of course an employer's prerogative to pay a new hire as it wishes so long as the company can afford it and their shareholders don't quibble (especially for listed entities with a heavy presence of SAF alumni). Of the three possible reasons listed above, the second is the most troubling because it may be a sign that market benchmarks for SAF pay need to be reviewed. In general, SAF officers tend to think about a career transition around the age of 30. This is the time when their first contract is about to expire. A sense of personal ambition ("I can do better outside") or a sense of reality ("I'll never make it past +insert rank+ and should leave now") are common triggers for career transitions by younger officers. SAF officers who are promoted are obliged to stay with the organisation as part of their moral obligatory service (MOS) for accepting the promotion. The SAF's MOS tenure is said to be two years long. Some officers do not take up the MOS lock-in period, decline the promotion opportunity and leave. The next trigger point is around the age of 40 when individuals choose to carve a new career in the private sector before they are too old to make the transition. Specific to Republic of Singapore Air Force (RSAF) pilots, the number of pilots who want to switch to civilian flying careers has apparently been strong and sustained enough to support a niche industry set up to assist military fliers who want to get their Airline Transport Pilot (ATP) certification. Demand is such that at least one ATP hot house has a dedicated programme for RSAF pilots on its website. No other ASEAN air force or Asia-Pacific air arm for that matter, has attracted their attention to the same extent as RSAF candidates - at least none known to this blog. Considering the importance of the RSAF to Singapore's defence, we pray that military aviation careers in the air force are on a strong footing. Our combat pilots are in demand by commercial airlines. Why? Not because RSAF pilots speak English. So do the Australians, Indians, Malaysians, the New Zealanders and many others in the region. The RSAF-specific focus probably stems from awareness that RSAF fliers come with a strong pedigree and count as valuable additions to any airline's bench strength. Alas, it is also sobering to think of the possibility that there is sufficient demand from RSAF pilots who want out to justify the niche service. It is estimated that it will take about $5 million to get a pilot to the OCU stage prior to joining squadron service. 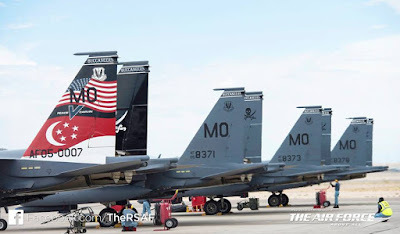 Upon entering an operational squadron, a pilot's pay is said to account for a fraction of the cost per flying hour for a fast jet like the F-15 and F-16. Similar arguments can be made for critical roles, say for example, submarine officers in the RSN and the army's C4ISTAR officers. But you probably get the picture: We risk losing officers who can command and fight our latest and most capable war machines if these individuals are unnecessarily distracted by bread-and-butter issues. In the case of RSAF pilots, one does not expect them to demand the sun and the moon. Informal calculations show that about $2,000 more per month will make the opportunity cost of leaving the air force high enough to make one think very carefully before punching out. Yes, that's still a chunk of change in any language. But relative to the cost of the platform and how much it takes to keep it flying, it is a pittance. It is Singapore's loss if we let market forces whittle away the SAF Officer Corps, especially under current conditions where a high ops tempo strains the organisation's leadership. Every officer who resigns prematurely leaves behind a gap that is not easily filled. This is because the pipeline of candidates with the requisite professional expertise, leadership qualities or operational experience to step into the vacancy is limited. One must fill middle to senior appointments from within and cannot simply recruit from outside like private sector organisations. One hears that it is not uncommon for regulars within a unit to double hat, with some holding concurrent appointments with open-ended tenures. The added workload, unceasing and demanding operational tempo, high expectations from the bosses and public creates a vicious cycle where unhappiness stirs among those called upon to make additional sacrifices. So there's a knock-on effect for every resignation. Anecdotally speaking, one has heard of fathers and mothers in uniform who have missed birthdays; sons and daughters who have experienced the same. A good number have been away from their loved ones when needed because duty calls. In many respects, one could say this is par for the course. It is what the men and women signed up for and they did so with their eyes wide open. That's absolutely true. But a career as an SAF officer also comes with the social compact that the compensation and benefits from such a career pathway are compelling enough to overshadow such sacrifices. 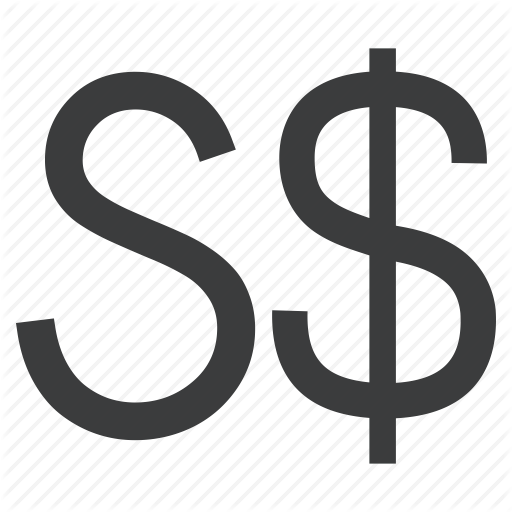 Pay matters are never easily resolved. When asked if you are underpaid in an organisational climate survey, one might guess the response most people would give. Tax payers would bristle at suggestions that armed forces personnel should be paid more. Everybody has an opinion how much is enough. To be sure, the SAF's voluntary attrition directly linked to remuneration has not reached epidemic proportions. But remuneration for critical appointments and those with long lead-time vocations must be resilient enough to withstand market forces. A salary review would help determine if that is the case today. Comparisons with salaries of other armed forces often give no clarity especially when one has not factored in cost of living adjustments specific to the Lion City whose limited size has made the cost of homes one of the most expensive in Asia. Warfighters, like all other salaried staff, have expectations for their family and lifestyle too and the pay scales for SAF officers must keep in step with the times. When you look at emergency vehicles in Singapore from the civil defence and police, you are likely to find studs around the windshields and windows of frontline vehicles. These studs serve as attachment points for wire mesh screens that protect the glassware of Home Team vehicles during operations. Many of the emergency vehicles that responded to Singapore's Little India riot on 8 December 2013 had these studs but went into action without the protective mesh (which was stored back at base). Twenty-five vehicles had their windshields smashed and windows shattered. Some vehicles were overturned. Five were set ablaze. It was a shambles. 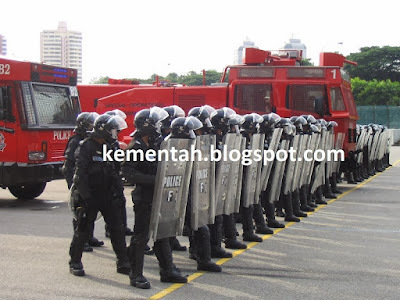 The Singapore Police Force has prepared and practised drawer plans for internal security situations, including riot-type scenarios of a far larger scale than the one that erupted at Little India. TTX, FTX, they've done it all. But the forces trained, organised and equipped with the tactics, techniques and procedures to quell civil disturbances were held in check by authorities. The chilling police announcement, Disperse Or We Fire, seen so often at internal security exercises, was not broadcast on that fateful night. After the rioters spent their fury, they found themselves surrounded by police in the small enclave with nowhere to run. Some 40 trouble makers were eventually arrested and the perpetrators faced justice. No lives were lost. 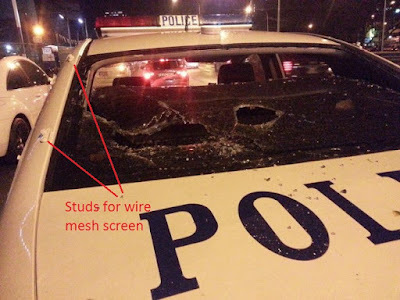 So the Home Team had the equipment (wire mesh protection) but no chance to install such protection before actual ops. The police had the drawer plans to smash riots swiftly and decisively but held its forces in check for various operational reasons. Telescope this analogy to the armed forces (generic reference and not specific to the Singapore Armed Forces) and you will find many instances where soldiers, sailors and airmen were caught unprepared by sudden and unexpected crisis. Tragic are the situations where fighting units have the equipment and training but lacked the tools to do the job when they are needed most because it was locked in the armoury or because the unit was caught in march order with its guns limbered. British infantry at Isandlwana during the Zulu War outgunned the human waves of Zulu infantry. The red coats would have shot the Zulu attacks to pieces on open ground were it not for the lack of access to rifle ammunition that was locked in packing cases on supply wagons. Several tactical engagements fought during the 70-day Malayan campaign during WW2 saw British and Imperial units destroyed by surprise attacks by Japanese forces who moved with unexpected speed to catch the units while their vehicles were nose to tail in tight convoys. Equally tragic are cases where the fighting forces are ready and willing to carry out their duty but are held in check by political indecisiveness or non-military considerations. The fighting forces may be good to go and excel at what they do. But when the time comes to press the button, would the political masters have the guts to do so? As a visiting Israeli general once said: Deterrence is Force multiplied by the Ability to use it. 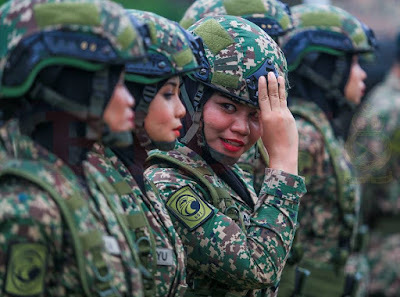 The armed forces of neighbours Malaysia and Singapore made it a heavy news day yesterday (1 March 2019) with the federation officially launching its largest land warfare exercise, codenamed Satria Perkasa (Mighty Knight), while the island republic passed a record $15.5 billion (US$11.4 billion) defence budget. The coincidence is serendipitous as Hari Tentera Darat (Army Day) falls on 1 March and the Committee of Supply debate for Singapore's national budget for respective ministries (called Heads) unfolds in a fixed format whose scheduling is hard to predict as it depends on the time taken by parliamentarians to discuss preceding Heads. 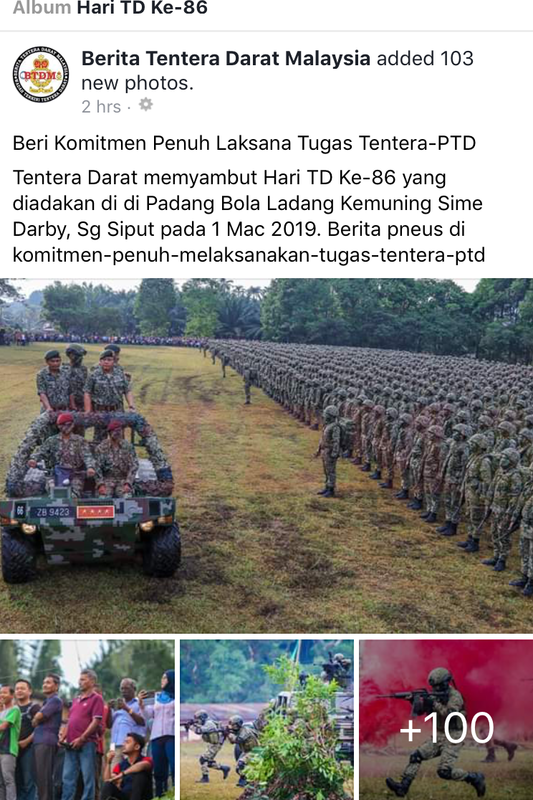 The Malaysian Army treated netizens with a massive album containing more than a hundred images - one of the largest photo albums for a single event this year - on its Berita Tentera Darat (Army News) Facebook page that show celebrations to mark the army's 86th anniversary. The picture selection was so wide and preparations like watermarks so time consuming that the images were uploaded around 6am the morning after. Eksesais Satria Perkasa is a major capability demonstration by Malaysian land forces that involves simultaneous army operations on Peninsular Malaysia and East Malaysia from today till 11 March 2019. 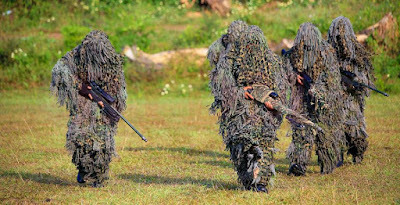 It is a complex division-level exercise in command and control in two theatres that puts to test Markas Angkatan Darat's (Army HQ) ability to marshal, deploy and execute army operational orders for more than four thousand troops via Pemerintahan Medan Barat Tentera Darat (Army Field Command West) which covers the peninsula, and Pemerintahan Medan Barat Tentera Timur (Army Field Command East) which is bestowed with responsibility for army operations in Sabah and Sarawak. 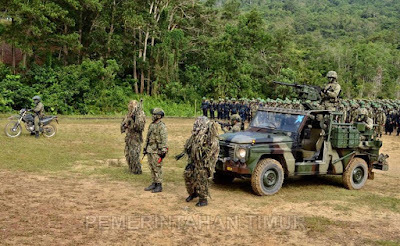 Realistic: Eks Satria Perkasa is a two-sided land warfare exercise. Note the use of enemy simulators (blue uniforms) at the launch of the war game at Kem Sampadi in Lundu, Sarawak on 1 March 2019. 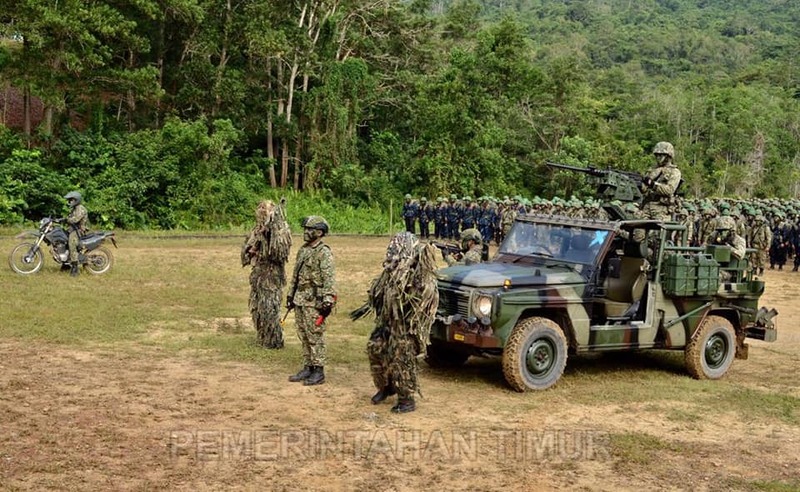 Troops from 2 Divisyen are now involved in the peninsula phase of the two-sided war game while 1 Divisyen is leading the Sarawak phase of the exercise around the areas of Lundu, Bau, Puncak Borneo, Tebedu, Mongkos and Engkabang. 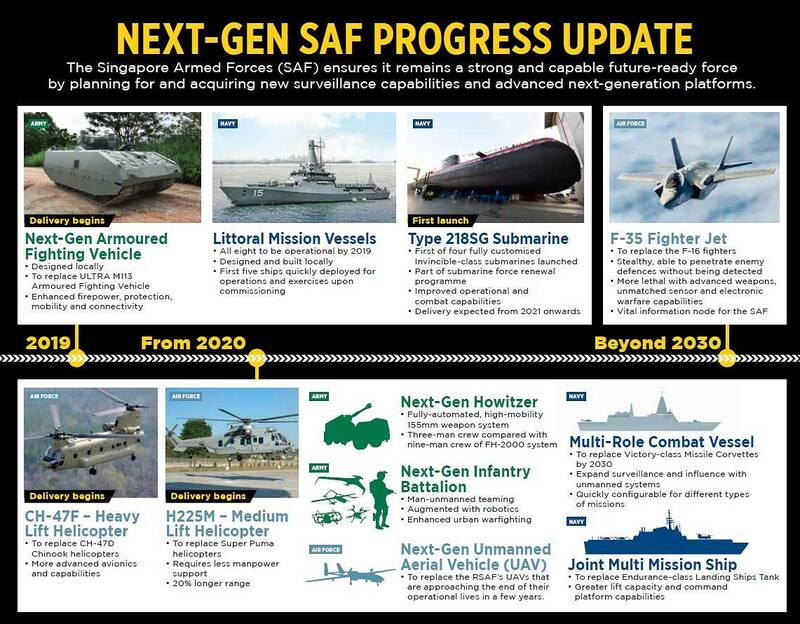 Meanwhile in Singapore, fellow Five Power Defence Arrangements (FPDA) member had a raft of defence updates of its own. 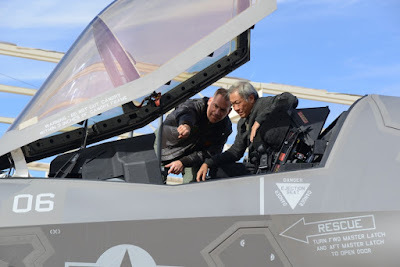 Chief amongst these is the revelation that Singapore will buy four Lockheed Martin F-35 fighters for trials with options for another eight F-35s. Interestingly, the model of the F-35 that the Republic of Singapore Air Force (RSAF) is keen to buy was not revealed. The acquisition of four test platforms is interesting as this makes the RSAF's test batch the largest among F-35 customers and is twice the number of test aircraft that Australia and the Netherlands bought two trial planes respectively for their air force. Singapore's defence spending is expected to hit $15.5 billion (US$11.4 billion) for the current financial year, which begins on 1 April. This amount is up from $14.8 billion (US$10.9 billion) the previous FY, while Home Affairs and Foreign Affairs spending is expected to hold steady at $6.7 billion (US$4.9 billion) and $0.5 billion (US$0.4 billion), respectively. The Defence and Home Affairs portfolios collectively account for some 30 per cent of Singapore's total budget for the coming FY. During the parliamentary debate for the Singaporean Ministry of Defence (MINDEF), Defence Minister Dr Ng Eng Hen shared infographics that outlined efforts to build a next generation Singapore Armed Forces (SAF). Of interest are the shadow drawings for the Singapore Army's next generation self-propelled artillery gun and improved all-terrain tracked carrier, which are expected to be designed and made by local weapons maker, Singapore Technologies Engineering. The new SP gun is likely to be a wheeled design with a 155mm and automatic projectile and charge loader mounted aft of an all-terrain chassis. The new tracked carrier is thought to be the Bronco 3 variant, which is an enlarged marque of the combat proven Warthog Bronco 2 design (the baseline Bronco used by the SAF is the Bronco 1). On the naval front, the Republic of Singapore Navy has a shadow diagram of its own that has fuelled intense speculation. The shape, form and number of the so-called Joint Multi Mission Ships that are slated to replaced four 141-metre Endurance-class tank landing ships has yet to revealed and rumours abound of a light helicopter type design. The RSN's ThyssenKrupp Type 218SG Invincible-class submarines are slated to go into service around 2025 while The navy's six 62m Victory-class Missile Corvettes (MCV) are due to be replaced by a Multi-Role Combat Vessel (MRCV) by 2030. 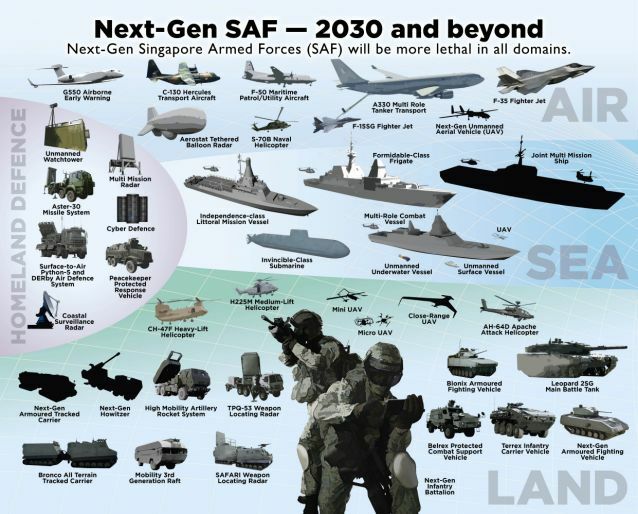 Several mission critical elements like improved landing craft capable of ferrying MBT-sized payloads and anti-missile defences are noticeable by their absence from the infographic, which is possibly constrained in granularity by its topline view of SAF assets. Singapore's defence minister pledged to keep defence spending at around three to four per cent of the national budget, even with neighbouring countries increasing their arms expenditure. Malaysian war machines are on the move in large numbers, but there's no cause for panic folks. 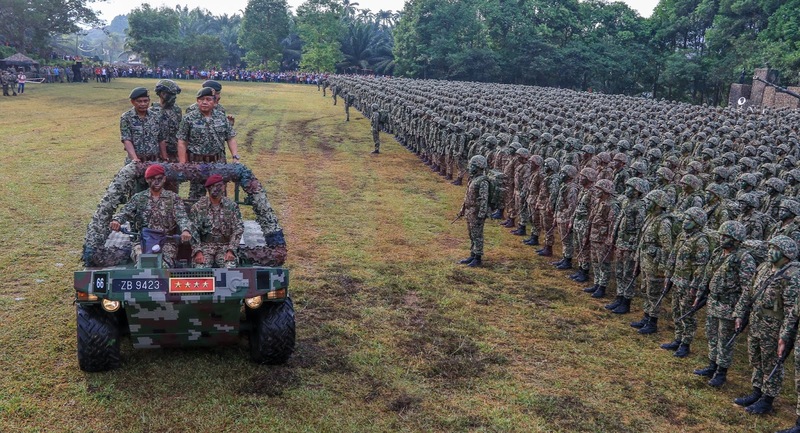 The Malaysian Army celebrates its 86th anniversary tomorrow (1 March 2019) with a parade and display of military equipment in the northern town of Sungai Siput in Perak. 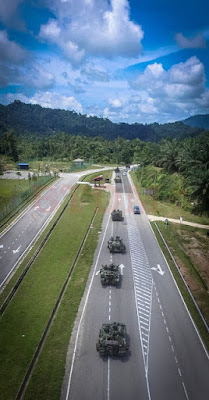 The movement of some 2,000 troops and a sizeable number of combat vehicles to the northern state of Perak for the anniversary sets the stage for the Malaysian Army's 10-day war game, codenamed Satria Perkasa (Mighty Knight), which is due to take place from Saturday (2 March'19). 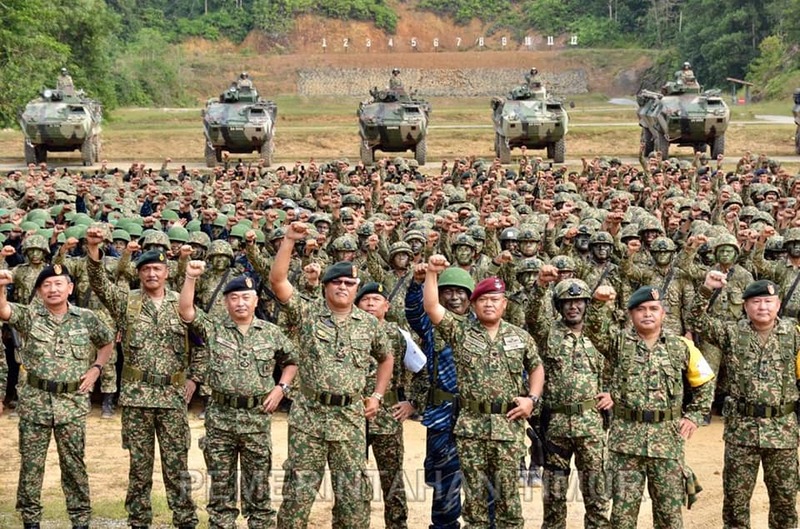 The upcoming war game will be the largest land warfare exercise staged by Malaysia this year. You can expect the manoeuvres to boost the Malaysian Army's profile as a steady stream of mainstream and digital media reports planned by the Markas Tentera Darat's (Army HQ) PR staff are said to be in the pipeline. These will provide daily updates on various facets of the exercise such as men and women involved, the military assets that have been committed and the tactical scenarios encountered by Malaysian warfighters. A spike in the number and frequency of social media updates by the Malaysian Army, especially images of the exercise posted by its online news portal, can be expected during the course of the exercise. 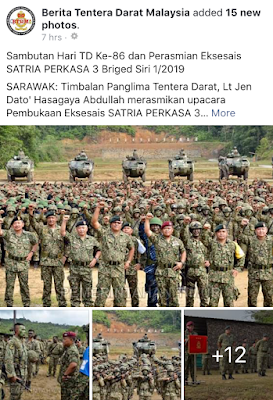 The burst of publicity will complement the kinetic phase of Satria Perkasa as it will test how the army's news-gathering apparatus and SOPs can support Markas TD in the information domain. 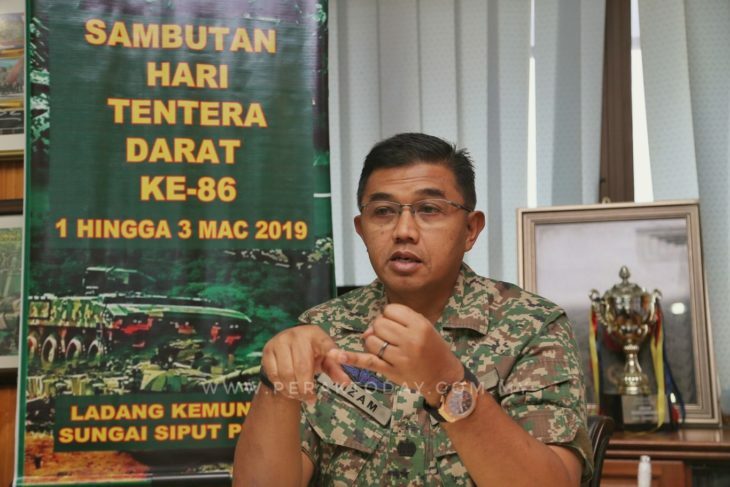 Since January this year, senior commanders from Markas Tentera Darat have conducted readiness inspections of units in Peninsular Malaysia and East Malaysia in the lead up to Eksesais Satria Perkasa. At least seven such visits were publicised in the Jan-Feb period. Units featured in Eksesais Satria Perkasa pre-publicity include the Penang-based Markas 2 Divisyen (which marked its 50th anniversary this month and has an area of responsibility that covers the northern states of Perlis, Kedah, Penang, Perak, Kelantan and Terengganu), 6 Briged and 6 RAMD, the crack 10 Briged (Para) rapid deployment force based in Melaka as well as a host of combat engineer, signals, transport and workshop units in Sarawak under 1 Divisyen. 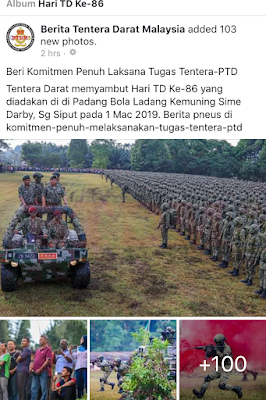 Satria Perkasa's scenario involves activating and deploying Tentera Darat units across the peninsula to counter an unspecified threat from the north. The Malaysian Army has advised the public not to be alarmed should they see military convoy movements around the peninsula from 2 March to 11 March'19. 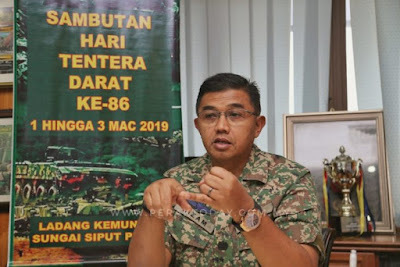 Commander 2 Briged, Brigadier General Datuk Mohd Nizam (above) said at a recent media briefing:"The exercise will start in Sungai Siput and move towards Gerik. During this time, kampung residents will see many military vehicles on the road. It has a fictional scenario where the enemy has taken a part of our territory and we are given the responsibility of driving them away. I hope that the public will not panic because this is not a real scenario. It is only an exercise." 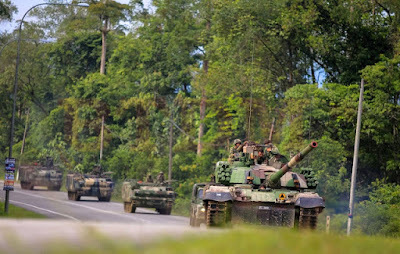 The 2016 instalment of the exercise allowed 4 Briged (Mekanize) to practice deploying its tank and APC assets across distances of 150km on federal roads and FELDA plantation tracks. 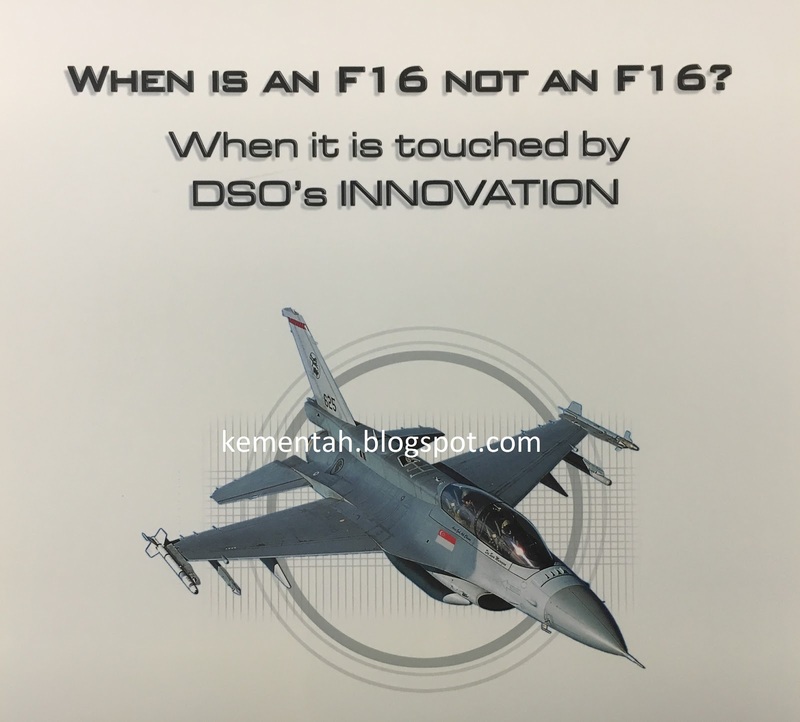 Thought-provoking: An intriguing poster from Singapore's DSO National Laboratories featuring an RSAF Lockheed Martin F-16D. When buying war machines from a country that tells all with full disclosure, are there no more military secrets to hide? There undoubtedly are and it would be premature and ill-advised for armed forces to discard security classifications without thinking through long-term repercussions. While sharing the type and number of war machines supplied gives observers an idea of what's in the arsenal, such data does not tell the full story. Assessing combat capability goes above and beyond merely counting hardware. A thorough assessment of combat capability therefore encompasses a slew of inputs, the nature of which often treads on sensitive ground where one needs to navigate with care or risk stirring coffee with sometimes unpleasant civil servants. Broadly speaking, these factors give observers an deeper understanding of how ready the war machines are to do their job if the button is pressed. Are war machines ready to roll to carry out their mission or is the tank/fighter jet a workshop/hangar queen? The answer delves into hardware issues (reliability, availability, maintainability, durability etc) and heartware matters (commitment to defence from individual warfighters, unit esprit etc) because having a machine in tip-top mechanical condition counts for nothing if citizen soldiers are no-shows during a mobilisation. How capable is the logistics support for sustaining operations? Resupply rates for POL and war shot and the methodology for sustaining operations cannot be easily discerned from the orbat. In addition, warfighters sometimes take a leaf from commercial operations, as was the case some years ago when the Republic of Singapore Air Force sent a team overseas to observe how cargo for air freighters was sorted. These sort of innovations are not reflected in orbat numbers. What (if any) modifications have been made to customise the war machine to one's specific operational requirements and battle conditions? Placed side by side, weapon platforms that have benefited from capability enhancements often look identical externally to vanilla platforms. How will the weapon be organised for battle? Once shipped, the decision on the scale and distribution of the weapon is one that the customer alone decides. Countries that source equipment from the European Union and the United States must be prepared to see information on their purchases eventually appear in the defence press. Armed forces that traditionally keep their cards close to their chests must therefore adapt quickly and accept the reality that the arms trade today aspires to be more open than yesteryear. Gone are the days when defence journalists will accept vague lines such as "weapon ABC was sold to an undisclosed Southeast Asian nation". Today, expect the scribes to dig deep, dig often and join the dots in an effort to see the big picture. For the Singapore Armed Forces (SAF), greater transparency in the global arms trade can contribute to deterrence particularly in situations where third parties (i.e. 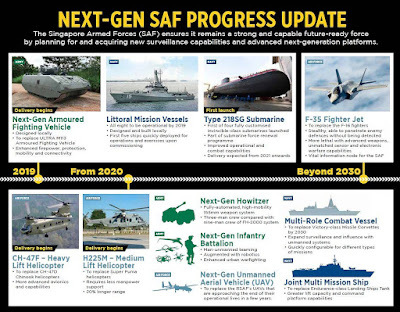 the supplier) disclose capability enhancements that might be awkward for the Singapore Ministry of Defence (MINDEF) or SAF to say as the public signature or optics would be quite different. So while observers know that the arsenal is expanding, information on other aspects of the arms purchase should be safeguarded with a robust military security apparatus. When observers are left with a fuzzy and indeterminate notion of one's true strength, it is this strategic ambiguity that cautions scenario planners not to miscalculate lest their underlying assumptions are incorrect. This week's Defense News story, "German documents reveal Singapore received more Leopard 2 tanks" (click here), is an example of how observers learned about the republic's upsized Leopard tank fleet even when officialdom said essentially nothing. Journalist Mike Yeo noted in his story on additional deliveries of German-made MBTs to Singapore: "According to the register of conventional arms exports released by the German Ministry for Economic Affairs and Energy, Singapore received 18 Leopard 2 main battle tanks in 2017, adding to the seven tanks the German government said it exported in 2016. "The additional delivery in 2017 brings the total number of tanks received by Singapore to more than 170. "It’s unknown how many tanks were ordered or what variant of was delivered. It is also unknown if this latest batch of tanks are brand new or refurbished secondhand vehicles, although the former is unlikely given production of the Leopard 2A4 has ended." Moves to acquire more Leopard 2s through small incremental purchases that result in the total headcount creeping up steadily mirror earlier examples where small weapon purchases grew and grew over years, if not decades. It is an example of defence creep where the population of proven platforms and systems grew steadily, often out of the public eye. The AMX-13 light tanks, A-4 Skyhawks and F-5E/F Tiger IIs are examples of retired SAF war machines that started with modest numbers on the orbat but gained noteworthy critical mass, thanks to defence creep. It's a tricky balance between being open lest potential opponents underrate one's capability and keeping some capabilities under wraps to catch other people by surprise. But let's be clear that every credible military force has trade secrets to protect - and for good reasons too. One can expect occasional tidbits from European arms registers and arms notifications to the US Congress on weapon sales, not just on what Singapore acquires but what armed forces in the neighbourhood are buying too. Absolute numbers aside, it remains to be seen how the Army's upsized fleet of more than 170 Leopard 2 tanks will be grouped for combat. Will they be cannibalised for spares or does the larger main battle tank force presage more transformations from the Army that might lead to the establishment of an armoured division and a rethink of current divisional estab as birth rates dwindle? 1. 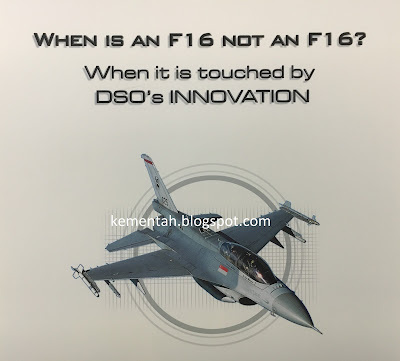 The Republic of Singapore Air Force (RSAF) and Defence Science and Technology Agency (DSTA) have completed their technical evaluation to select the next generation fighter to replace its F-16s. 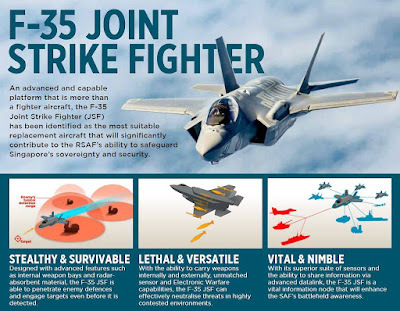 The F-16s will have to retire soon after 2030 and the F-35 Joint Strike Fighter (JSF) has been identified as the most suitable replacement to maintain the RSAF’s capabilities. 2. 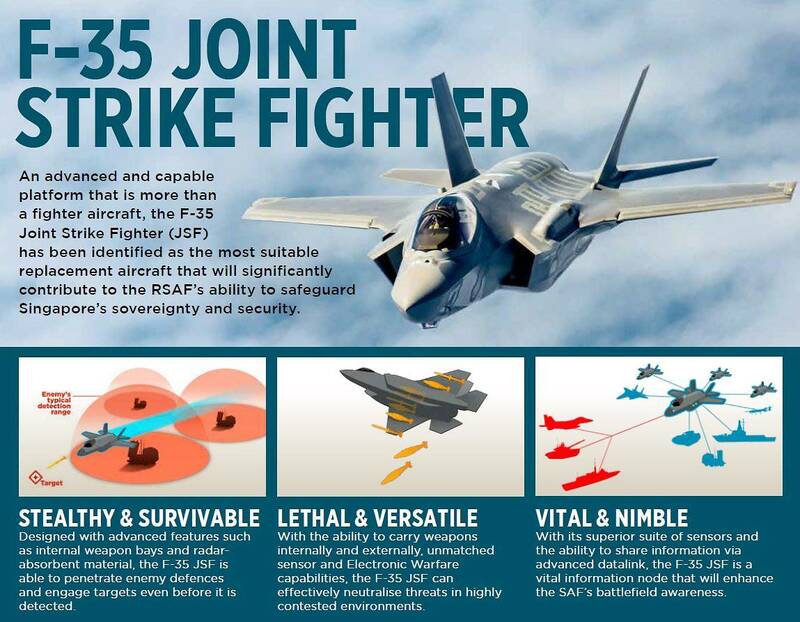 However, the technical evaluation also concluded that the RSAF should first purchase a small number of F-35 JSFs for a full evaluation of their capabilities and suitability before deciding on a full fleet. In the next phase, MINDEF will discuss details with relevant parties in the US before confirming its decision to acquire the F-35 JSFs for Singapore’s defence capabilities. There was no sign of the rough patch in Malaysia-Singapore ties over air and sea space, looking at the tenor of our bilateral defence relations which enjoyed a good run this November. Up until recently, the Angkatan Tentera Malaysia (ATM, Malaysian Armed Forces) and Singapore Armed Forces (SAF) continued to build on longstanding ties, thanks to a packed calendar of events that gave personnel from both countries many professional and informal opportunities to know one another better. With this week’s sudden turn of events that put border security in the spotlight, ATM and SAF personnel who invested time and effort to forge warm and friendly relations may wonder if it was all for nought. On Tuesday, Malaysia said it wanted to take back control of airspace over South Johor, which the UN’s International Civil Aviation Organisation had delegated to Singapore and which the Republic had been managing for decades. That same day, Singapore lodged a strong protest with Malaysia over its move to extend the Johor Bahru port limits into Singapore’s territorial waters off Tuas. Singapore officials also revealed that Malaysian government vessels had made 14 incursions into Singapore's territorial waters in the prior two weeks. And so, like a bolt from the blue, the goodwill established between two armed forces has been overshadowed as the neighbours shoot diplomatic notes, claims and counter-claims at one another. The ATM and SAF staged two war games successfully last month. The 24th edition of Exercise Semangat Bersatu (which means Unity in Spirit), held from 18 to 28 November, involved 980 personnel from both armies who trained together in Johor. From 26 November to 3 December, Exercise Malapura saw some 600 personnel from the Royal Malaysian Navy and Republic of Singapore Navy come together to practise the planning of naval operations and deployment of warships, helicopters and warplanes for maritime security scenarios in the Malacca Strait. On a broader front, the Malaysian Army hosted the 28th ASEAN Armies Rifle Meet in Melaka for marksmen from the 10 ASEAN nations to pit their skills against one another in friendly competition. Army chiefs from all ASEAN members attended the event, which had the theme “Fostering Camaraderie” as its call to action and from the smiles and handshakes seen, everyone lived up to the spirit of the annual shooting meet. More informally, army ties benefitted from Malaysia’s hosting of Eksesais Joint Adventure Training in Pahang from 26 to 29 November. The army exercise – which was actually a series of team-bonding games - saw about 50 personnel from both armies get to know one another through outdoor activities like hiking and beach games. While the games at the political and diplomatic fronts augur well for relations, other realities can cloud the positive picture. It is thus timely to remember certain cardinal principles in international relations. First, ponder the imponderable. Ties between countries can deteriorate suddenly without warning. As we witnessed from the good outing the ATM and SAF enjoyed recently, external forces can reset relations overnight. One need not live a distrustful, paranoid life because scenario planning that helps develop drawer plans for imponderable scenarios should allow everyone to sleep better at night. Above all, continue to build on friendships at all levels despite the atmospherics – as the ATM and SAF recently demonstrated. Second, be aware of grey-zone conflicts. This is a metaphorical state of being between war and peace, where one country may aim to win either political or territorial gains associated with overt aggression using military or paramilitary forces without crossing the threshold of open warfare with its rival. 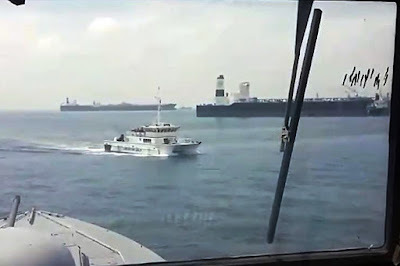 Malaysia’s deployment of Jabatan Laut (Marine Department) and coast guard vessels is a classic example of how gray-zone rivalries pan out and mirrors the aggressive moves made by coast guard forces of certain countries who try to assert authority in the South China Sea. Relations between some countries are easy to figure out. Russia-Ukraine, Saudi Arabia-Qatar and to a lesser extent Turkey-Greece are examples of pairings where diplomats shoulder the burden of historical baggage that stirs continued enmity. As for our Little Red Dot, bilateral spats should provide a wellspring of teachable moments for successive generations of Singaporeans to learn the difference between rhetoric and realpolitik. The ongoing border issues over maritime borders off Tuas and air flight zones over Seletar only serve to expand Singapore’s bank of stories for national education classes. Finally, think long term. 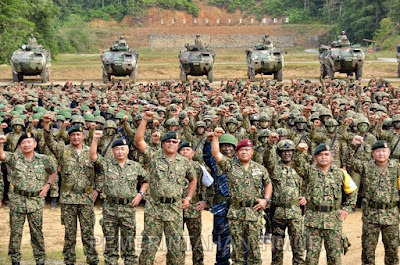 Coming back to a defence-related example, the Semangat Bersatu army exercise would not be what it is today if army officers gave up building rapport at the first rebuff. Malaysia’s hosting of the 1st Battalion, Singapore Infantry Regiment in Kluang, Johor, is an achievement that the exercise planners could only dream of when Singapore hosted the first of the war games in May 1989. When it came to Malaysia’s turn in October 1989, Singapore had to fly its soldiers to Sarawak as the federation was not ready to see SAF troops train in Johor. It took years before the trust and comfort level reached the point where SAF troops could step on Malaysian soil in the peninsula for a bilateral exercise. Indeed, many of the 1 SIR regulars and full-time national servicemen who took part in the recent war games were not even born when the groundwork was laid nearly three decades ago. So never allow temporary irritants to distract one from gunning for long-term good. Army leaders from Malaysia and Singapore showed what can be accomplished over decades with continued efforts to build friendship and trust. Stormy ties? Just wait, years if need be, and let the irritants eventually fade out. Indeed, Singapore’s Coordinating Minister for Infrastructure and the Minister for Transport Khaw Boon Wan sounded a similar note this week when he urged people from both sides of the Causeway to look ahead. Mr Khaw said: "When I discussed the High-Speed Rail (HSR) project with (Malaysia's Economic Affairs) Minister Azmin Ali, I had a distinct feeling that the young ministers in Malaysia want a fresh relationship with Singapore, without any past baggage."